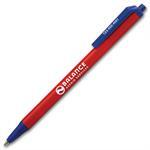 Let your customers know you're thinking about them by sending them custom imprinted promotional Pens. 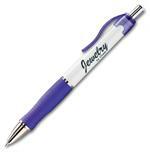 Make it easy for customers to hold onto your message, by giving them this classic removable-cap pen with textured rubber grip. Fine point includes choice of black or blue ink. BIC and Grip Roller are registered trademarks of BIC. Select a Second Imprint Ink Color, (Optional).